note the shades of gray to white between the sky and the statue. Yikes! Here are some works from a travelling class with Nancy Macgregor. We were in the garden at the Madison Christian Community on a sunny but cloudy day. Then we were at the Memorial Union on a grey and rainy day. But we found a canopy over the bandstand for outside painting, while some chose to paint inside. So here is life and its imitation. and because it is two weeks away another clip of the Bridges Class poster. Admit it, you could use time to enjoy the out of doors. We have a rain plan. 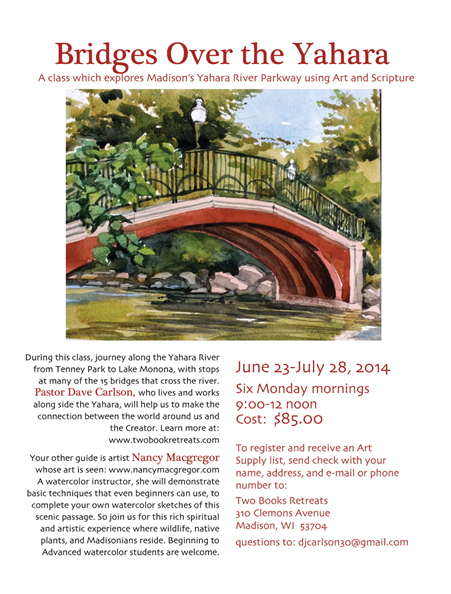 Nancy Macgregor is a gifted artist and instructor. You don’t need to know anything about painting to join the class. You will learn something about observing and keeping a journal. Every day it is different along the Yahara. There is wildlife to observe there. Bridges are interesting to paint. contact Dave Carlson at twobookretreats@gmail.com to inquire or register. See poster and registration here.